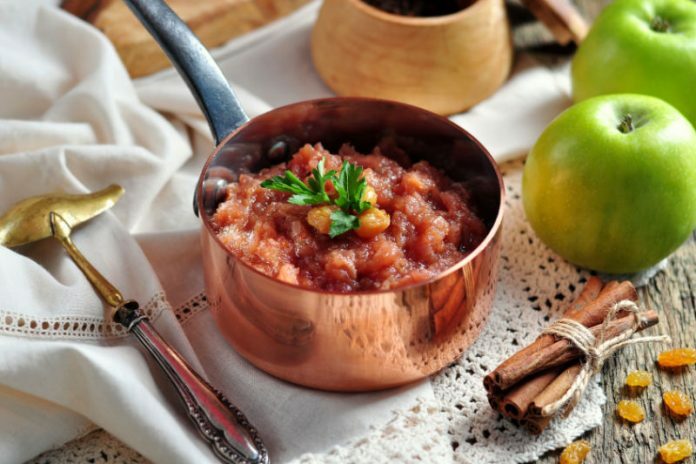 While you might associate apples with desserts like apple pie, this apple chutney recipe is actually the perfect accompaniment to your more savory culinary creations. Whether it’s a beautifully baked pork tenderloin or a golden roasted chicken, this sweet and spicy apple chutney is a wonderful sauce to pair it with. If you’ve made a fruit jam before, then you may be familiar with the process of making a chutney. This apple chutney requires just a handful of ingredients and comes together very easily. Like jam, you’ll want to throw all your ingredients into a saucepan and cook the ingredients until they’re tender, glossy, and thick. The resulting apple chutney can be stored in the refrigerator for up to two weeks. You can use this apple chutney recipe as a dipping sauce for your finished meats, or you can actually brush the chutney onto the meat as part of the cooking process. Add all of the ingredients to a saucepan over high heat. Stir to combine the ingredients then bring the mixture to a boil. Once it's boiling, reduce the heat to low, cover the saucepan, and let the mixture simmer for about 40 minutes. After 40 minutes, remove the lid from the saucepan and allow for any excess liquid to cook off. Remove the chutney from the heat and allow it to fully cool before covering and refrigerating.